I've always been a huge advocate of salads, especially those that can double as actual meals. So many people think salads can't fill them up, or worse, they get the "restaurant salad" which is arugula and a shaved something (which won't fill you up for more than 10 minutes). It's a recipe for thinking salads only belong as starters. Another thing, I use the word salad as a lose term. It doesn't have to be green, or even made OF greens (ex: quinoa salad). This shaved asparagus salad is as light as Springtime (which it finally is!! ), but satisfying enough to be a main meal. Even though the radish is technically shaved, it's not the only thing on this salad. The crunchy chickpeas (addictive enough on their own) add such amazing texture and the true holding power to this "green" salad. Preheat oven to 400 degrees (°F). In a mixing bowl, dry chickpeas well. Mix together with spices, salt, pepper and olive oil. Make sure chickpeas are evenly coated. Then, place in an even layer on a foil-lined baking sheet. Bake for 35-40 minutes or until super crispy and browned. Set aside to cool. Trim the edges off all asparagus stalks. Using a vegetable peeler, shave asparagus, and add to mixing bowl. Continue until all asparagus has been shaved (save the scraps and use for stocks or soup). Using a mandolin or paring knife, shave radishes and add all vegetables to a large mixing bowl. I used watermelon radishes, but feel free to use any radish variety you can find. They're all good! Season with salt and pepper. In a small jar, add all dressing ingredients and shake until well emulsified/combined. Drizzle dressing over salad, toss well and add to serving bowls. Top with roasted chickpeas, microgreens and flaky sea salt. Serve immediately! THIS POST WAS ORIGINALLY SHOT FOR H&M ! Raw kale caesars are the one thing I never tire of. I pretty much order them whenever they're offered. At home, I like mine with a few hippie add-ons and poached egg for breakfast (or really, anytime of day). This almond caesar dressing is naturally dairy-free, but has the bold, zingy flavor that every caesar needs. You'll want to put it on everything - and I won't stop you. 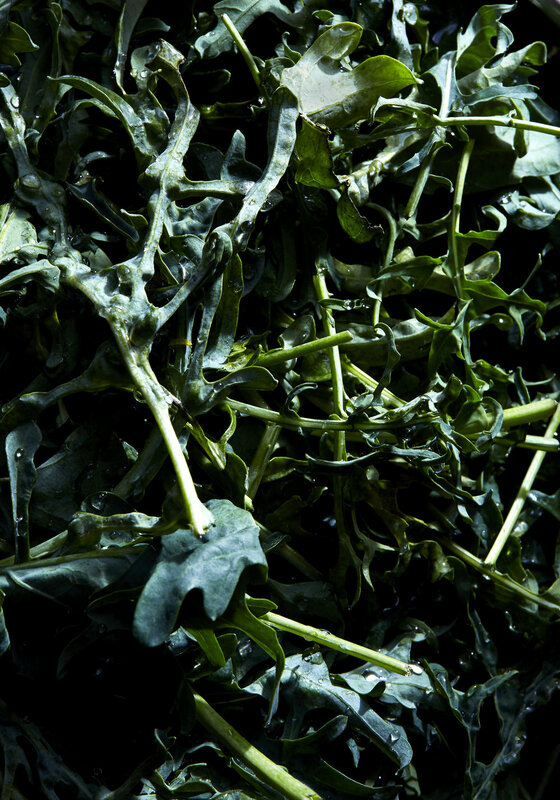 In a large mixing bowl, massage the juice of one lemon into kale. Sprinkle with sea salt and set aside. Then, make almond dressing: After soaking almond, rinse and drain well. 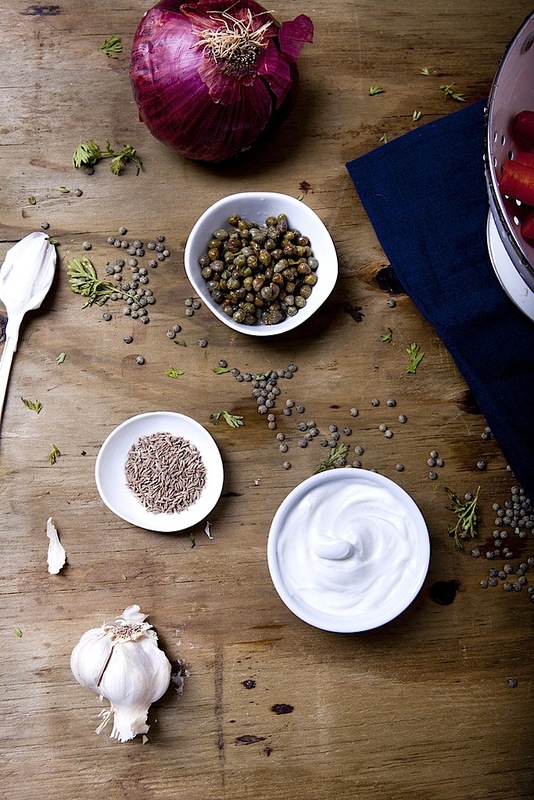 Add to high-speed blender or food processor with the following five ingredients. Blend ingredients well, then stream in olive oil until desired texture. Season with sea salt and pepper. Mix kale together with sliced radish, avocado and microgreens and hempseeds. Toss in desired amount of dressing (it's on the thicker side, so use your hands to massage it in). For more MORNING MEALS head over to CAMILLE STYLES! I've been pretty inspired by the work of Yotam Ottolenghi lately, as I know many of us are. I've always been intrigued by his beautiful books and recipes, but recently fell in love with his story after hearing him (and Sam Tamimi) on Heritage Radio Network's TASTE MATTERS. If you know anything about this man, you know his recipes and flavor combinations are LEGIT, both in aesthetic and taste. He merges his Israeli heritage with the influence of the Western world and a serious understanding of vegetables. Classic is not a word I would use to describe him, but I mean that in the best way. He still manages to reflect a sense of cultural appreciation while making some pretty refreshing dishes. Of all Ottolenghi's talent, I appreciate his boldness most. Both his recipes and food philosophy don't easily fit into one box. Although it is often vegetarian, he doesn't abide by that rule exclusively. You may have noticed I myself have stopped labeling my eating habits as vegan, vegetarian, pescatarian, etc. What feels most important to me is experiencing food in the way that is most satisfying to me and leaving labels aside. Usually, what feels right to you will resonate with others as well. Preheat oven to 450 degrees. In a small mixing bowl, combine olive oil, cumin seed, mustard, garlic powder, 1/2 teaspoon sea salt and 2 garlic cloves. 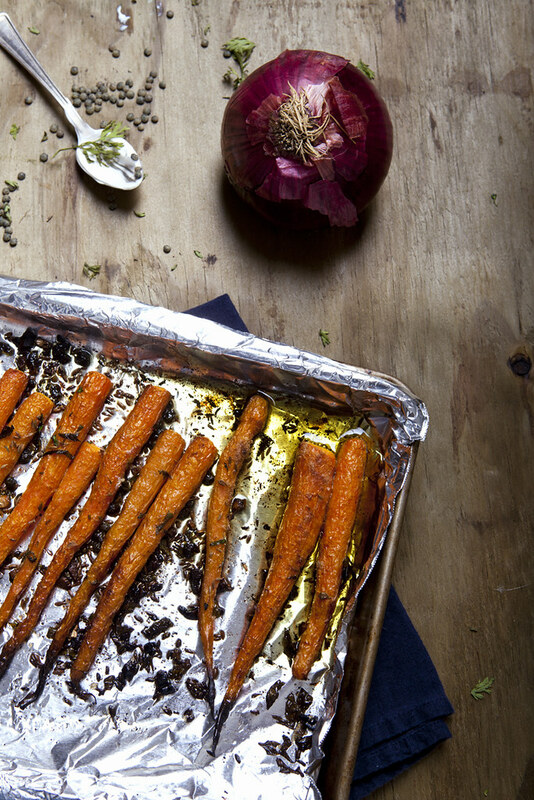 Add carrots to a foil-lined baking sheet, then drizzle dressing overtop, making sure carrots are well coated. *NOTE:I used a bunch organic carrots which are on the smaller size. If yours are large, I would quarter them lengthwise, or you could just chop them in large chunks and roast that way. Roasting time will vary. Add to oven and roast for 30-35 minutes or until super browned and tender. Set aside. 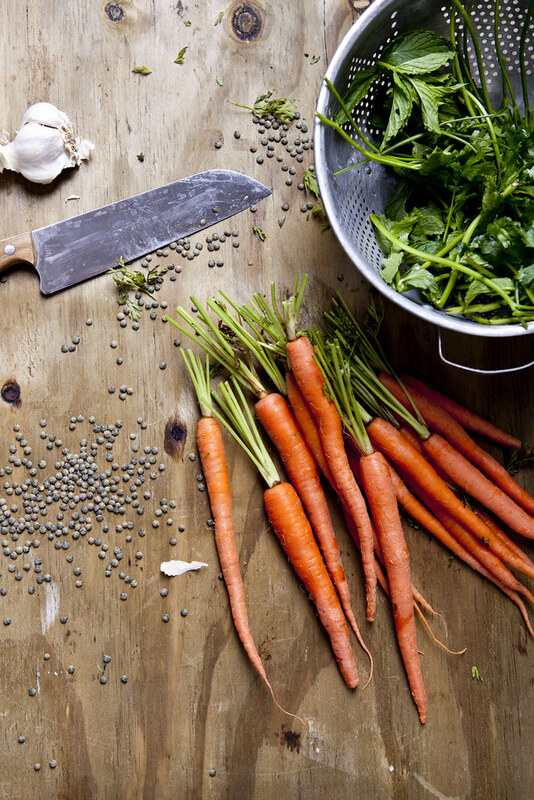 While carrots are cooking, add 1.5 cups of lentils to a large saucepan with 1/2 teaspoon sea salt and about 4 cups of water. Bring water to a boil, then reduce to simmer (uncovered) and cook for 20-30 minutes or until tender, but not mushy. Once finished cooking, strain lentils in a sieve to remove any excess water. Set aside to cool. In a small mason jar or bowl, muddle 2 tsp. capers, 1 minced garlic clove until broken down well. Add the zest and juice of 1 lemon, a good pinch of salt (about 1/2 teaspoon), and a drizzle of olive oil. Whisk together well. Add lentils to a large serving bowl and fold in the caper dressing. Toss to coat well. Add shaved onion, fresh mint, and parsley. 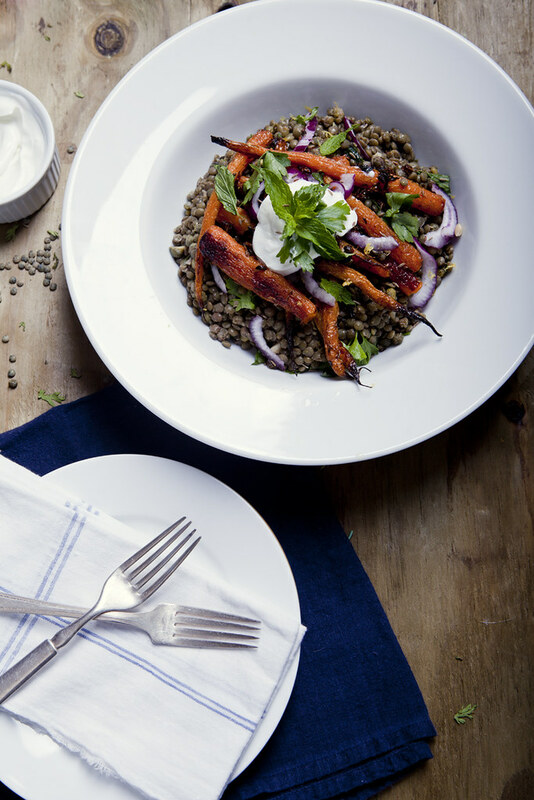 Top lentil salad with roasted carrots and a dollop of greek yogurt. Season with flaky sea salt and freshly ground pepper to top. Serve this salad warm, cold over greens or with toasted bread. 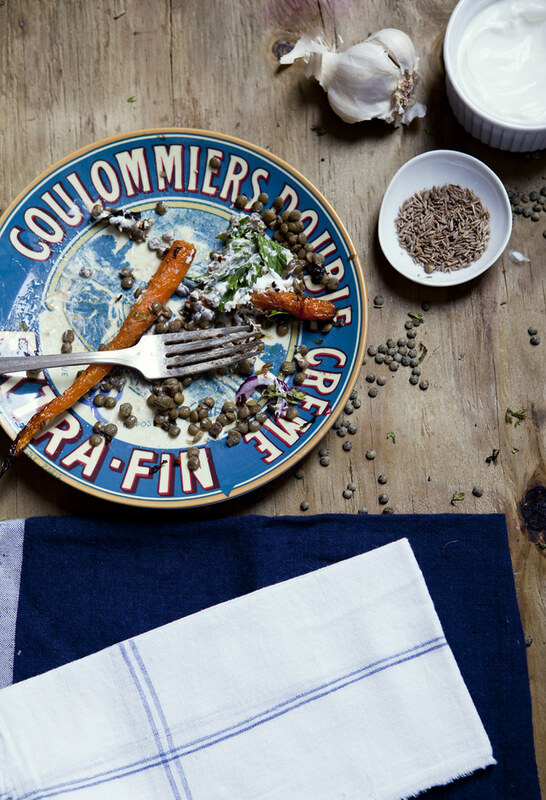 CLICK HERE TO READ THE RECIPE FOR CUMIN SPICED FRENCH LENTIL SALAD!